We’re Expanding! 15 to Fit Pilates Studio seeks motivated individuals who wish to further their career in Pilates Instruction. We currently offer Pilates equipment and fitness classes and one on one instruction in which we educate, motivate, and support our clients to improve their health and fitness. Our studio is located in Mooresville right off of Exit 33 on Williamson Road. We are expanding to the Huntersville area. You can earn $15-$30 per hour and from 10 hours per week to full time training. 15 to Fit offers a casual, fun environment, amazing equipment, and the opportunity to learn the inner-workings of a successful Pilates training studio. This is an amazing opportunity to expand your Pilates knowledge without having to travel to different parts of the country and spend hundreds of dollars in workshop costs! You will have the opportunity to work on a daily basis with two Pilates Masters. Patrea Aeschliman, owner and founder of 15 to Fit, has over 35 years of experience and is a national expert in the field of health and fitness. Patrea is a National Strength and Conditioning Association Certified Strength and Conditioning Specialist. She has five different Pilates certification and is comprehensively trained in Power Pilates. She teaches a combination of both Contemporary and Classical Pilates. David Holland is a comprehensively trained Pilates instructor and received his Pilates Certification through Smart Workout in NYC in 2012. His mentor was world renowned instructor Ann Toran of Pilates Reforming New York. At least one (1) Pilates Equipment Course or Certification. Kinesiology or Exercise Science degree. Objective of Training: To teach functional anatomy, the biomechanical principles of Pilates exercises, and their application to the Pilates Mat, Reformer, Chair, Cadillac, Barrels, Springboard/Ladder and Cross Core Suspension Trainer. Course includes 75 hours of class instruction taught over 6 weekends (approx. 12:30pm to 7pm) along with additional hours for class and video observation, self-practice to master the Pilates exercises, practice teaching on friends and family, apprentice teaching, and test outs to be scheduled later. Not Experienced? We will train you! Are you an exercise science graduate, personal trainer or just a fitness enthusiast? Want to increase your fitness knowledge and marketability? 15 to Fit Pilates Studio seeks motivated individuals who wish to begin a career in Pilates Instruction. Even if you don’t have prior Pilates experience, we will train you. You could earn $15-$30 per hour and work 10 hours up to full time training clients each week. 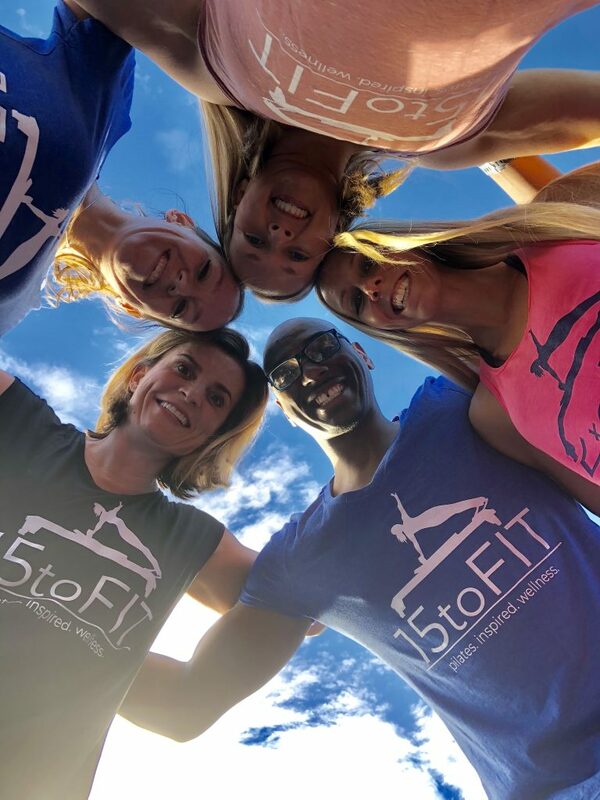 15 to Fit offers a casual, fun environment, amazing equipment, and the opportunity to learn the inner-workings of a successful Pilates training studio. Why work at 15 to Fit? We’re very fair, respectful, and appreciative. We like having fun and making money providing highly valuable Pilates & Fitness services and products. You will be compensated fairly, treated fairly, and we will certainly look for ways to pay you more for your efforts if they warrant it. We want someone who enjoys working with people and making a difference in the lives of others…because that’s what we do in our studio. This is an amazing opportunity to expand your Pilates knowledge without having to travel to different parts of the country and spend hundreds of dollars in workshop costs! You will have the opportunity to work on a daily basis with two Pilates Masters. You can become a Comprehensively Trained 500 hour Pilates Instructor for only $1,500. Patrea Aeschliman, owner and founder of 15 to Fit, has over 35 years of experience and is a national expert in the field of health and fitness. Patrea is a National Strength and Conditioning Association Certified Strength and Conditioning Specialist. She has five different Pilates certification and is comprehensively trained in Power Pilates. She teaches a combination of both Contemporary and Classical Pilates. David Holland is a comprehensively trained Pilates instructor and received his Pilates Certification through Smart Workout in NYC in 2012. His mentor was world renowned instructor Ann Toran of Pilates Reforming New York. The initial commitment is with an investment of $250. This cost covers your initial training which consists of Beginner Mat, Small equipment and Part I of Level I Reformer Instructor training. You would then need to complete five (5) additional training sessions at $250. each. The investment to become a Comprehensively Trained Private Pilates Instructor (includes mat, equipment, group instructor and private instructor certification) totals $1,500. Total fee is $1,250. if paid up front. There are scholarship and tuition reimbursement opportunities available. In order to be considered for this position, visit our website for information about us and this training program and apply online or call 704-880-8870 for information. APPLY TO BE A TRAINER NOW!